Born from an intense collaboration between Italian architect Umberto FELCI and the DUFOUR DEVELOPMENT TEAM, the 460 GL is a yacht of excellence, that guarantees high level performances as well as absolute comfort, in harmony will the values of latest Dufours : Majestic aesthetic, with her new hull and deck design Ultimate comfort, with her interior layout inspired from the Dufour 500 and 560 Optimal functionality, with her bowsprit and her fully equipped exterior galley Ultimate outcome of the Grand Large range renewal, the Dufour 460 wins the challenge to seduce owners in search of a three or four cabins layout, and affirm herself as the new reference for 45 feet yachts. COMFORTABLE PERFORMANCES The naval architecture has been developed by Felci Yacht as a guarantee of the latest innovation in the hull form and appendages design combined with rig design layout that aim to maximize comfort on board with a well-balanced yacht in all sailing conditions. The rig layout shows a very high aspect ratio to have the maximum sail lift and efficiency with a self-tacking jib and a full batten mainsail. 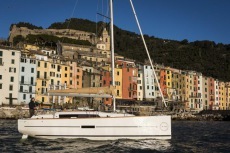 The deck plan is also optimized to fit two longitudinal rails in order, for the more performance driven customers, to have a 108% genoa with extra sail area. The boom is inclined forward like on all the Dufour Grand Large to have an easier access at the boom gooseneck area as well as having the extra sail area which is a must in the Dufour DNA. The deck plan has beed designed carefully following the 365, 375 and 380 clients’ suggestions to better suit their needs and their experience on board. The cockpit is 10 cm longer than the previous 380 as well as the helmsman area to improve the interference with the backstay, a fixed bowsprit is going to be available as optional to fit code 0 or similar sail to keep sailing a pleasure without too much effort. Genius of ergonomics and comfort, this yacht borrows from its bigger brothers all the finesse of style that takes the quality of life to new heights, when sailing as well as at mooring. Designed for long-haul sailing, life aboard benefits from every convenience, thanks to its open cockpit, among so many other features. Unique sensations, a pleasure that is re-invented each day. From tiny details to infinite pleasure. The very incarnation of French chic, the Grand’Large 500 is more than a lifestyle: it’s a way of life that’s reserved for the most sophisticated among us. Above decks as well as below, in that which is visible just as in that which is unseen, the design is so modern, the comfort so absolute, it’s almost enough to make one blush. The Grand’Large 500 is determinedly grand in all senses of the word. AUDACIOUS, INNOVATIVE, PRECURSORY The Grand Large 410 is designed to simultaneously seduce the skipper and the crew. The helm area has been tuned to facilitate manuvering for the captain, while the crew enjoys a spacious cockpit, wide side decks and an expanded swim platform. Dufour’s designers have clearly focused on optimizing each space according to its function, enhancing the cruising experience for everyone. From the mooring to the windward mark, graceful lines radiate elegance on every point of sail. The roof profile isbrightenedwith an LED lightingstrip, a fresh styling touch that will surely set the trend for future designs. An interior with unprecedented possibilities Living aboard the Grand’Large 410 is a pleasure that continuously reinvents itself. Everything is created to be reconfigured according to the time of day and desired setting. The navigation table, fully functional for sea passages, easily converts to a comfortable and adjustable sofa, perfect for on-board entertaining. The owners cabinis packed with cruising comforts but also transforms into a cinema room, optimized to enjoy sound and image. Every part of the boat offers multiple functions and differentcomfort levels. The most surprising innovations are discretely integrated, perfectly suited to a variety of purposes. The entire interioris a masterpiece, created by an ergonimic genius guided by intelligence, creativity and the drive to acheive absolute comfort. DUFOUR 310 Grand Large - A Small Big Boat The Dufour Grand Large range continues to evolve, producing boats with a perfect balance between comfort, performance and timeless design. The strategy of Dufour Yachts, which has been producing boats for 50 years, is to increase its product portfolio, and now the range has been enriched with a 31 feet yacht containing details and technology typical of bigger boats. Particular attention has been posed in trying to simplify its use. The boat can also be fitted with a shallow keel, where the boat can self stand, ideal for lakes as well as specific areas of very shallow water. The new yacht is a fast cruiser whose waterlines, deck and interior design achieve a perfect balance. This is the result of the passion for the sea and care for details with which Dufour Yachts have obtained their position as an international market leader. The new Grand Large 310 provides unique pleasure when it comes to cruising: it is fast, lots of fun, well-balanced, comfortable and easy to steer, even for a single handed purpose. There are many reasons why this model is so special, starting with the project’s designers. 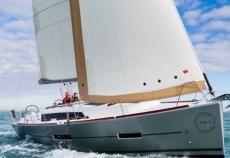 Once again Dufour Yachts has relied on the talented and innovative design of Felci with whom the yard won both european and american yacht of the year with the Dufour 36 Performance last year. The Dufour 310 deck is an evolution of the latest design trend of the Dufour 410 and 500 inspired by the original “arpage” deck shape. The cockpit is pretty unique being the first one with double steering wheels as standard as well as double rudder blades to guarantee perfect boat balance and control even when heeled. The sail plan is presenting a high aspect ratio to maximize performance on one hand, while on the other the non overlapping self tacking jib guarantees maximum ease of use with a limited crew. 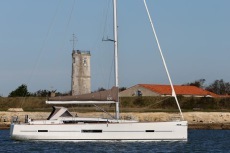 The Dufour 310 has an internal layout divided into two cabins, an ample dinette and one bathroom. The precious oak materials have been entrusted to experts and skilful craftsmen. Particular attention has been paid to enhancing the flow of light, from the big hull and deck windows lots of natural light is guaranteed, which makes the interior a pleasure to live in. This boat reflects a discreet and comfortable concept of luxury. The Grand Large 310 embodies the lifestyle that Dufour has infused into its projects over the last 50 years, distinguished by an authentic passion for the sea, design, technology, performance and innovation, as well as safety. True benchmark in its category, the White Shark 298 is recognized by its sleek line to guarantee timeless aesthetic behavior exceptional marine and total security. This large shark will fit all navigation programs and may take up to 10 high-speed passenger. Perfect balance of elegance, performance and comfort, the White Shark 228 invites you to enjoy cruising in complete safety. Its hull recognized as one of the most powerful in its class will give you a true wellness navigation whatever the sea conditions while providing a silhouette sleek and timeless.